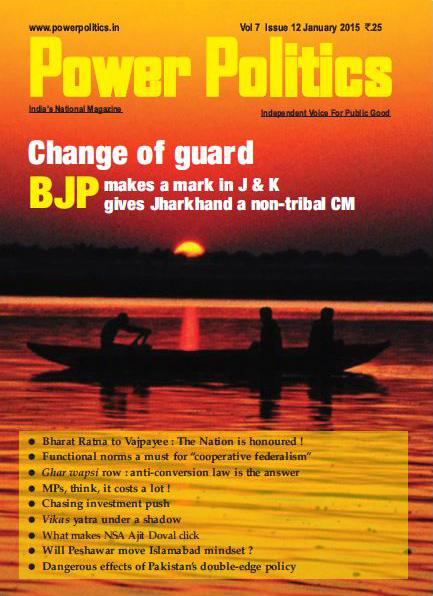 It is rare to read one single English news magazine in India and have whatever a vigilant citizen may need to update himself or herself to contribute meaningfully to our Republic. In the January issue of your think- tank magazine I have precisely this to read in my hands . All pieces in this issue are highly objective and non-partisan keeping in tune with the golden media ethics your magazine has preserved even amidst these trying times. This is magnificent indeed ! You have analyzed accurately the recent Assembly elections . You have rightly observed the verdicts in these elections offer no definite clue as to which party or group of parties would come to win the upcoming Lok Sabha elections this year. The road to the Lok Sabha elections is bumpy. The Bharatiya Janata Party’s supremo Narendra Modi, our current Prime Minister, its president Amit Shah and Uttar Pradesh chief minister Yogi Adityanath queered the party pitch in the three Hindi heartland states---Madhya Pradesh, Rajasthan and Chhattisgarh. There is, however, little for the Congress Party to gloat over. The verdict went in favour of K Chandrasekhar Rao in Telangana and Zoramthanga in Mizoram. Moreover, the Congress did not have a clear majority in Madhya Pradesh and Rajasthan. In Madhya Pradesh it has even scored less than the saffron party in terms of the percentage of the total votes cast. Rahul Gandhi Congress President Rahul Gandhi must draw a lesson from his party’s defeat in Mizoram and work hard to improve its prospects in the state as the nation will be inching towards the upcoming Lok Sabha elections. The party had been traditionally dominant in the region. But no longer so. It lost in the recent Assembly elections. It’s vote share dropped to 30.2 per cent from its 44.6 per cent in 2013. It was because of anti-incumbency sentiments. There had been allegations of corruption against it in the recent past. Also, some influential Christian groups are said to have ceased to be its constituency in the State. Besides, agriculture and horticulture— important sectors of the state economy— remained largely ignored. It is heartening to note that the much- publicized conversation on the visa- free Dera Baba Nanak- Kartarpur Sahib corridor Pakistan Army Chief Qamar Javed Bajwa and our Punjab Minister Navjot Singh Sidhu had at Pakistan Prime Minister Imran Khan’s swearing-in ceremony in August last has now started showing positive results. Our Prime Minister Narendra Modi and his Pakistani counterpart Khan must do everything possible to see to it that the proposed visa-free corridor is operationalized without any bureaucratic hurdles. The Kartarpur gurdwara is situated on the bank of the Ravi. Founder of Sikhism Guru Nanak is said to have meditated here. This makes it of very special significance to the Sikhs the world over. The Sikhs in India would be very happy indeed to have visa free access to this gurudwara. They are entitled to the freedom of religion. The partition of British India should not have resulted in the denial of this basic right to them. Such a claim is absolutely false . The Bharatiya Janata Party-led National Democratic Alliance (NDA) government had promised to generate two crore jobs annually. This has not happened. Our farmers have continued committing suicide. Ashraf Ghani During his visit to Delhi in September last, Afghanistan President Ashraf Ghani reportedly made a strong pitch for talks with the Taliban. He stressed the Islamic State and “foreign terrorists” were the problem in Afghanistan, as opposed to the Afghan Taliban . In November India sent a delegation of former Ambassadors to the Moscow conference on Afghanistan. It was attended by the Taliban’s representatives . The U.S. sent its diplomat based in Moscow as an “observer.” The acceptance of the Taliban as a dialogue partner is dangerous. It’s affiliations to al Qaeda are well known . The Taliban is hardly Afghan in nature.